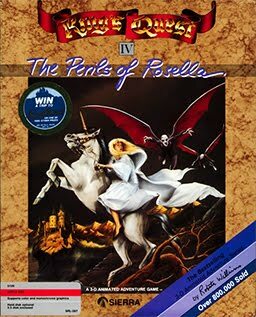 King's Quest IV: The Perils of Rosella was the fourth game in the King's Quest series. It was one of the first computer games to star a female character. It was released in both AGI and SCI versions, as Sierra thought at the time that people wouldn't have computers powerful enough to run the more capable SCI engine. The AGI version did not sell well, and today it has become somewhat of a collector's item. There are actually two SCI versions. The second one is included in the many King's Quest collections, whereas the first one is less common. The first version had AGI-style shading and different scenes for the night scenes, rather than simply recoloring the day scenes. The 16-color AGI version and both 256 color SCI versions of King's Quest IV are now supported by ScummVM, a program designed to let 2D adventure games run on multiple platforms. With ScummVM, King's Quest IV now runs on modern versions of windows, as well as Linux, Mac OS X, and many consoles such as Dreamcast, Wii, PlayStation 2, and PlayStation Portable. For a complete list of platforms supported by ScummVM, see here.